We offer half or full day fishing charters with experienced, local Captains. Whether you're boarding our 15-foot flats boat, or wading out, our guides will expertly navigate the tide, depth, bottom topography, fly design, and cast to maximize your odds of landing a giant. Fly fishing in Hawaii is extremely technical. 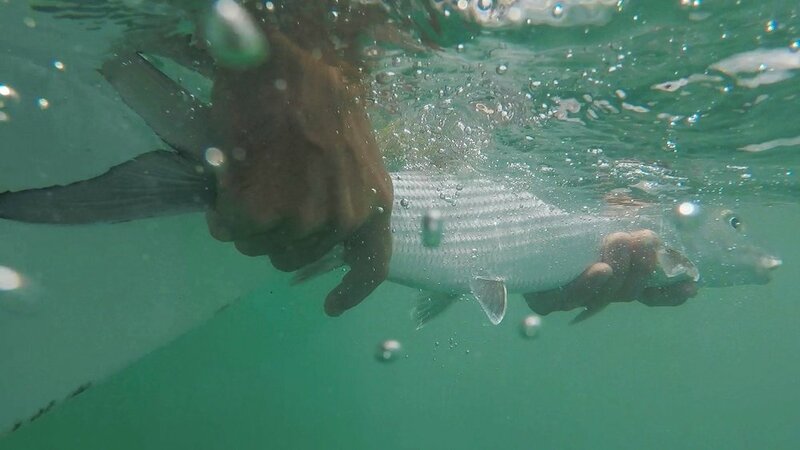 The bonefish are finicky and conditions change fast with the trade winds rolling in. Having a guide on your charter is paramount to increasing your odds. Throughout the years, we have perfected our craft of tying custom flies designed specifically for Hawaiian waters. Born and raised in Hilo, Hawaii, Makani has been fishing since he was 2 years old. With a love for the sea and a Naval Academy degree in Oceanography, Makani's experience throughout the past 35 years have perfected his understanding of fish habits and movement. He has extensive experience in bottom fishing, light tackle, cast netting, commercial fishing, spear fishing, and GT fishing. His passion for fishing extends to protecting fisheries around the world through his own political advocacy. He is the president of the Hunting Farming and Fishing Association here in Hawaii. Makani works closely with the community and local government not only to protect our natural resources, but to protect the rights of fisherman and preserve cultural fishing practices of Hawaii. Other accomplishments include 2009 Lahaina Jackpot Tournament Winner, 2012 Ironman Finisher, Candidate for US Senate 2016, and President of United States Naval Academy Alumni Association. During the infancy of Keawe Adventures, Makani joined a commercial fishing crew to pay the bills. During his commercial fishing years, he studied the habits of fish and their migration throughout the calendar year. Overtime, commercial fishing subsided with the growth of Keawe Adventures. Keawe Adventures employees specialize in World War II History, Hawaiian history and culture, surfing, fly fishing, spear fishing, and hiking. In 2017, Makani separated the fly fishing portion of his business and started Fly Fishing Hawaii- a stand alone company. Other accomplishments: 2009 Lahaina Jackpot Tournament Winner, 2012 Ironman Finisher, Candidate US Senate 2016, President of Hunting, Farming and Fishing Association, President United States Naval Academy Alumni Association.